If you're looking for an easy truffle recipe, these Oreo Truffles are absolutely perfect! Some truffles can be a bit finicky to make. I've had people writing in about their ganache not turning out right - too thick, too thin, too lumpy, you name it. 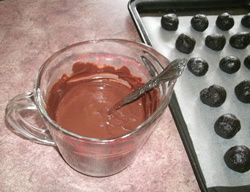 Ganache is fairly common as a truffle center. It generally consists of heated cream and chocolate (with the occasional added extras). 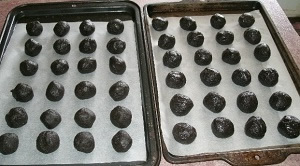 I love making truffles out of Oreo cookies, or any cookies for that matter. I was in a particularly adventurous mood over the holiday season and decided to add the ginger flavor to the mix. Instead of using actual ginger, I substituted some of the Oreo cookies with gingernut biscuits (that's Australian for ginger cookies - grin!). It gave them quite a nice "bite." However, I digress! I wanted to tell you about my Oreo cookie truffle adventure and give you this simple recipe so you can make your own. You're going to love them. I promise! One of the great things about this recipe is that you only really need three ingredients. Amazing, I know, but true! Combine the cream cheese with the cookie crumbs and roll the mixture into balls. Set them on a waxed paper lined tray and pop them in the fridge to chill for about an hour. Before you're ready to dip your Oreo truffles, you need to melt the chocolate. In this batch, I used milk chocolate and white chocolate to give it an extra festive look. I melted my chocolate in a large measuring cup in the microwave. It's quite easy to do, but it can all go horribly wrong if you overheat your chocolate. The secret is to only heat in short bursts (on medium if possible) and stir well in between. I start with 30 seconds to get it started and then switch to 15 second intervals. 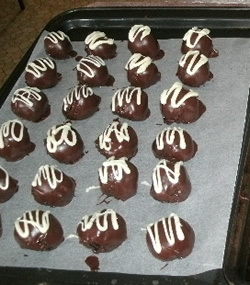 Dip each Oreo truffle ball into the chocolate and roll it around to coat thoroughly. I use a fork to lift the truffle out of the chocolate and tap off the excess before placing them on the waxed paper again to set. That's it! Of course there are many variations you can make, but that's the quick, easy, and simple version of this Oreo truffle recipe. If you want to add a contrasting color like I did, put a little of that chocolate into a Ziploc bag and heat it in the microwave (same rules as above). Squeeze (instead of stirring) until melted and then snip off the corner just a little so that you create a mini "decorator bag" that will let you easily let you drizzle your chocolate on top of the truffles. If you make this Oreo cookie truffle recipe, or create your own version, tell us about it by leaving your comments below or adding your own photos and recipe using this form on our chocolate truffles page. Can't wait to see them!